Buddhism | My Journey So Far…. I was waiting for the release of this film since it was screened at cans in 2008, but Indian censorship took its toll on this movie, and finally it is released. Main motivation for me to watch this movie was the film protagonist – Raja Ravi Verma. I wanted to see the story of that man who revolutionized the way we see our mythological characters. The man who was responsible for first creating the poster of Goddess Laxmi standing on a lotus flower, the way we saw her today in every Diwali poster. The man who made sari clad Indian women looked sexier and elegant at the same time. The man who made come alive ‘Shakuntala’, Damyanti, Urvashi, Menka, Saraswati and many more. The man whose imagination defined the pathway for Indian arts and paintings. You can write a book on Raja Ravi Verma and still you won’t be able to do justice to capture his large persona, so when it came to capturing his life in an almost 2 hour long movie, I was skeptical. But, I was not disappointed. 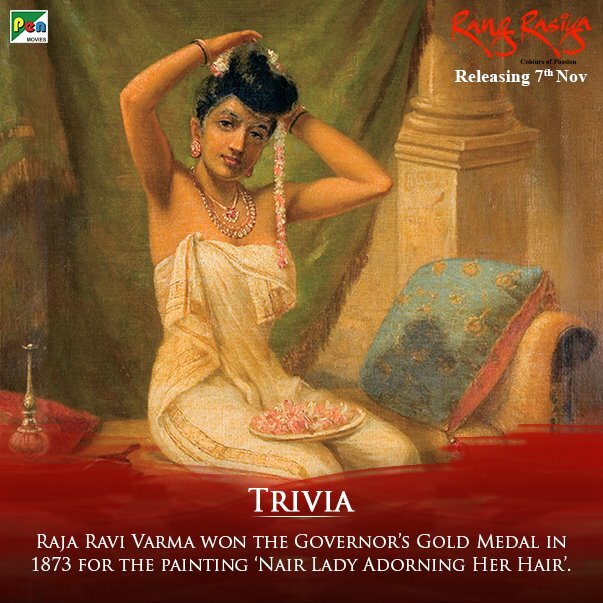 ‘Rang Rasiya’ is an Indian film based on the life of famous Indian Painter ‘Raja Ravi Verma’. This film is directed by Ketan Mehta of ‘Mangal pandey’ fame. It stars Randeep Hooda as the famous painter himself, and Nandana Sen as his muse. Feryna Wazheir and Paresh Rawal also plays a pivotal role in the movie. This movie portrays character of Raja Ravi Verma from childhood moment of painting elephant on a temple’s wall to his old age when he get motivation to change his course of painting and focus on common people rather than Gods and deities. The way this character rebels against the norms of society is commendable. His selfishness when it comes to painting is shown honestly. His guilt, his progression, his imagination, everything is filmed beautifully. The very first moment you will see the title song of the film, you will be hooked to it. It is like watching a beautiful painting taking shape in every scene of the film. But to advise you, this film is not for everyone. My husband almost dozed off twice while watching it and ultimately he left. Randeep Hooda has proven himself again. He has aged gracefully in this film, with every scene maturing his acting skills. His progression from a clueless but passionate painter to the one who is just eager to defy everything that comes in the way of portraying true art, is commendable. He has looked every bit of Raja Ravi Verma. Most laudable were the scenes of court, or his reaction when he saw his muse for the last time. Nandana Sen is one brave actress. 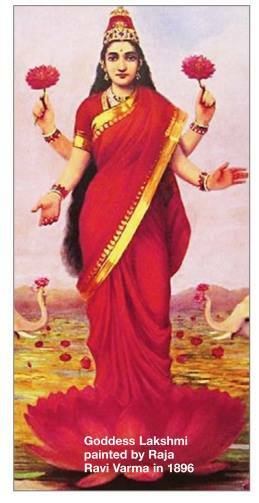 She has done justice to Raja Ravi Verma’s life and paintings. She has looked beautiful and acted superbly. She was vulnerable yet strong, jealous but still madly in love, she was the goddess and yet she was the earthly woman, who could only live in imaginative world of his lover. Most worthy of the praise is the scene when she discovers that her existence to Ravi Verma’s life is only in his imagination. Nandana Sen has etched a lifetime role. 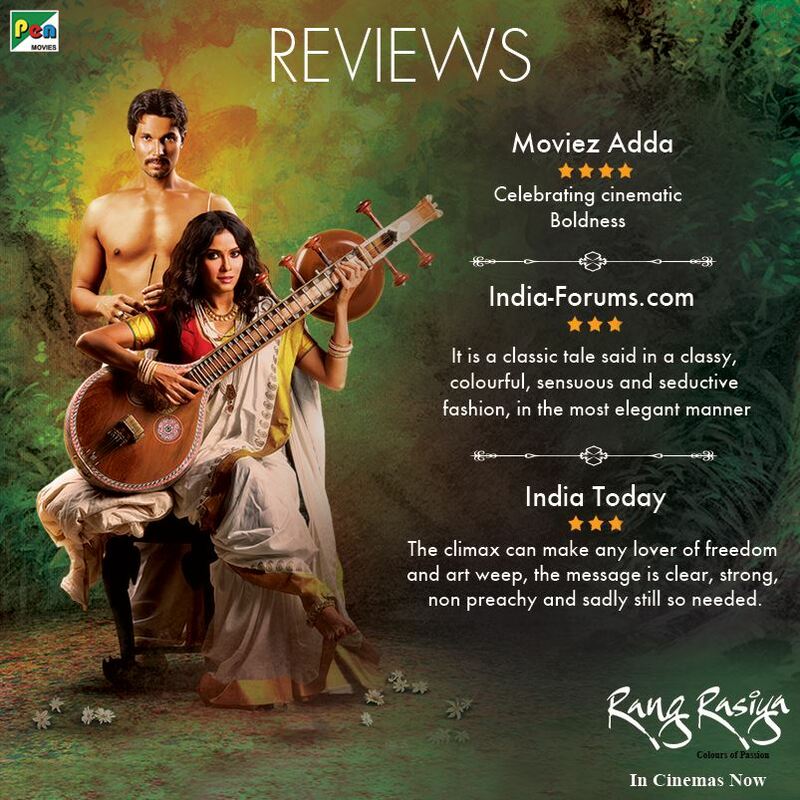 ‘Rang Rasiya‘, as a film is not perfect, it’s not even close to that, but if you watch it for Raja Ravi Verma, than it is far more that perfect. It is a masterpiece, just like all the paintings of Raja Ravi Verma. Note: All Photos credit to Rang Rasiya’s Facebook page.